UP 9533 is a General Electric (GE) C41-8W. This particular unit was manufactured by GE in 1993, with 4,135 hp, featuring a wide cab, C-trucks, and desktop controls and analog gauges. Here, there are lower gauges, which control light and cab HVAC systems. The round, red metal piece is activation for the horn via the foot. Engineer's seat is thick, adjustable black vinyl. Here I am in this GE cab, after having transited quite a number of miles, under direct supervision, on the Roseville Subdivision. Conveniently, I cannot recall the time, the date, the season or the specific details. Suffice to say: it was quite enjoyable. Some scenes have been changed to protect the innocent. Detail of this early GE desktop unit. After engineers had gotten used to numerous pedestal cab controls on the left, desktops confused them. Before the digital era burgeoned, the analog era beckoned. Reverser handle removed. It was in my pocket when I took the photograph. Back panel of this early GE desktop unit, to include start/stop switches and breakers. Precursor to desktop displays situated here. This panel sits directly behind the engineer, right side of the cab. Conductors desk, left side of the cab. Pretty spartan and ridiculously filthy, having seen almost 20 years of continuous use. Emergency brake application, radio microphone, refrigerator down on very lower right adjacent steps to nose of cab. Clear absence of speedometer. Brake pipe analog gauges. Explanations below. CFM indicator on far right. Sanding switches in blue. Overall and above view of engineer's seat, right side of GE cab. Fire extinguisher back of seat. Engineers complained, initially, of having to lean over desktop in order to make input to controls. This is before the cabs got really complicated with digital input and readouts. 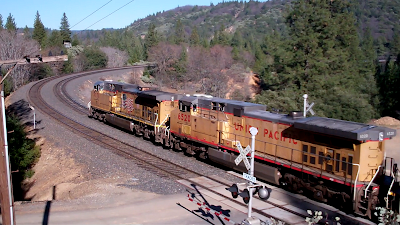 Whilst I monitor the comings and goings in the area of the Sierra Nevada mountains where I live, I happen -- now and then -- to come upon various trains that have stopped for various and sundry reasons. Because I tend to be ubiquitous at medium-to-high elevations, I make contact with any number of cab personnel who, mostly, don't wish to be identified. At all. With that in mind, here I sit in an older UP unit, a GE C41-8W, with 4,135 hp and manufactured between 1990 and 1993. A bit of irony: I'm wearing an EMD hat. From a stop, after much conversation and commonalities, I was allowed to drive this unit from roughly Emigrant Gap to Sparks. I did so safely and with input and monitoring. This happened sometime between 1998 and 2011. Oddly enough, I forget precisely when the event occurred. This was an elder but current unit still assigned to the Roseville Subdivision. It is commonly utilized in adjunct but not point power these days, because I've seen it time and again. Whilst I line up posts for new GE and EMD cab shots, I hope this one will do, with some detail that may satiate my readers for a time. Thanks to the cab personnel who made contact with me. Some are past and current friends. And thanks to their anonymity. I am not a terrorist. I am just a railfan who happens to have some items in common with the bulk of cab personnel, whether they be UTU or BLET members. I shot this with my older Flip Slide in HD but this particular cam, as you can see, lacks any form of image stabilization. That heat + my age = fairly unsteady. Also note that you can hear UP radio traffic. Listen closely. As always, if you open the video in YouTube, expand it and listen with headphones, the experience is enhanced. The situation is this: UP 7405 (a GE C45ACCTE, 4,400 hp, built in 2009, known by GE as their ES44AC), a westbound (downhill) grain train, hit the detector at MP 154.4, which activated. The engineer stopped his train prior to the Gold Run crossing. I was examining the EOT device when I heard UP 7435 coming uphill. UP 7435 is likewise a 2009 ES44AC with 4,400 hp. Directly behind was UP 5651, a GE C44ACCTE built in 2004 and rated at 4,390 hp. Pushing in DPU status at the end was UP 7637, a C45ACCTE built in 2007, rated at 4,400 hp. Go ahead, hit me. I can hear the comments coming already. I still haven't found the time to upload the newer cab shots. Even with DSL, the number of photos I want to post will consume the better part of an entire day to upload. And I have two posts of equally gigantic size to make. In lieu of that, I'll be making a quick-grab post about another excursion in an older UP locomotive shortly. 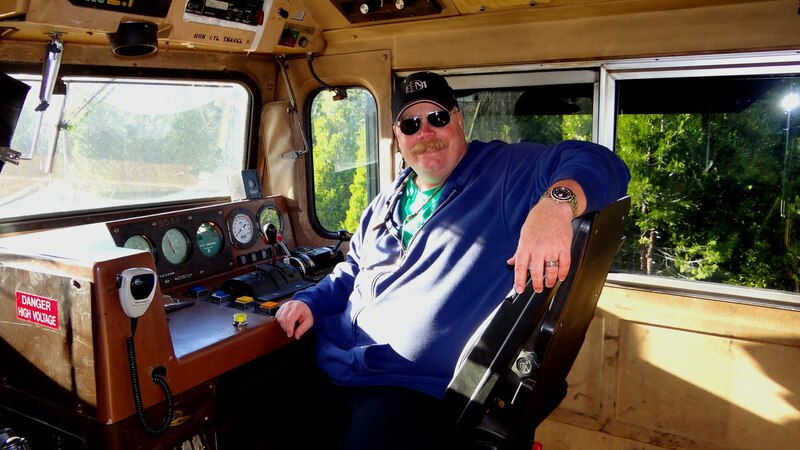 I was recently -- just in January -- invited into the cab of two new UP units representing the best of the two major American locomotive builders: GE and EMD. I first visited a GE ES44AC unit, which features 4,390 hp. I next visited an EMD SD70ACe unit, which features 4,300 hp. In detail, UP 5770 on point is a GE ES44AC (called a C44ACCTE by Union Pacific) manufactured in 2002, with 4,390 hp. Next up is UP 6520, a GE C44AC manufactured in 2000, with 4,390 hp. Third in line is UP 8222, a rather rare SD90MAC which UP labels as an SD9043AC with 4,300 hp and built in 1998. Fourth place features UP 2327, another rare EMD unit, which is an SD60M with 3,800 hp, built between 1988 and 1992. At the rear in DPU (Distributed Power Unit or "dupe") status is UP 5564, a GE C44ACCTE with 4,390 hp, manufactured in 2004. 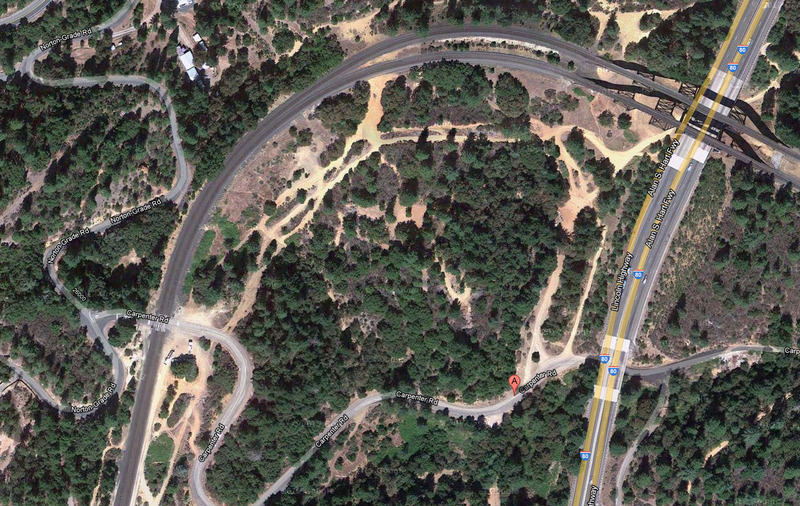 As you can see here in a view provided by Google Maps, the train is traveling eastbound (uphill) from Colfax and over the Long Ravine bridge. Here, the grade begins to get steeper, though the Ruling Grade over Donner is 2.4%. Actual photos from the two new GE and EMD cabs. Simply uploading these photographs will take, for me, literally hours over my DSL connection. First will be the GE ES44AC cab, then the EMD SD70ACe cab. I am conflicted, as you might surmise, when I board a cab interior whilst -- in direct contravention of various rules and regulations -- I am therein invited in. I suspect it is because I am a representative of an elder generation and because -- logically so -- I present no clear threat to UP staff and personnel. Because, in fact, I truly present no threat. Any UP employee who invites any individual into the cab also invites their own dismissal, their own firing, and perchance their own prosecution under any number of TSA or Homeland Security edicts. Despite this, I find myself invited into any number of locomotive cabs because, after all, I only wish to document the newer, upgrade cabs in real time. From a modern cab unit.